Back in the day, well okay, I was about 12 or so, my grandma would make these delicious bars on the weekend for me and my dad. They were delicious. 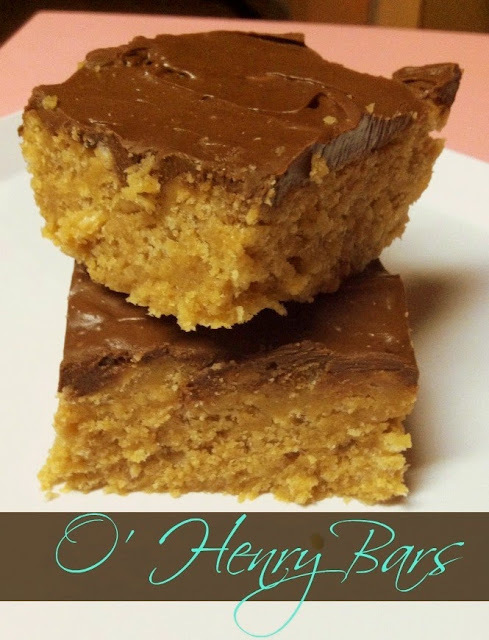 She called them "O'Henry Bars" and made her's with Cornflakes cereal. Now speed up time and these are more commonly known as "Scotcheroos" and made with Rice Krispies cereal. Either way you make them, or whatever you call them, they seem to always be every one's favorite. They never seem to fail and let anyone down. I do typically make mine with Cornflakes, because old habits die hard, I suppose :) But that's just how I grew up with them. But this time I didn't have enough on hand, but had enough Rice Krispies, so that's what I used. In a large saucepan over low heat, melt together the peanut butter, corn syrup and sugar. Heat just until the peanut butter is smooth and the mixture is warm. Add the cereal to the peanut butter mix and mix well. Pour and press into a buttered 9x13 or 8x11 pan. In the saucepan melt together the chocolate chips and the butterscotch chips until smooth. Spread over the cereal mixture pressed into the pan. Let cool completely before slicing and serve. Nice version of this recipe! and thank you for showing the bridge from today's scotcheroos, to the memorable O'Henry Bars. Searching for the classic recipe led me to your blog. Love it!